The Cyprus Department of Antiquities, Ministry of Transport, Communications and Works, announces the completion of the 2018 University of Edinburgh archaeological investigations at the multi-period site of Prastio-Mesorotsos in the Pafos district. 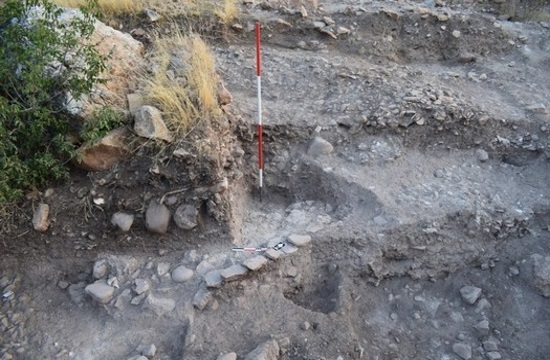 Excavations were conducted from 27 June to 8 August 2018 under the direction of Dr. Andrew McCarthy, Fellow of the School of History, Classics and Archaeology at the University of Edinburgh. The project involves the cooperation of an international team of specialists and field school students. The site is situated around a prominent rocky outcrop in the Dhiarizos Valley, and commands dramatic views to both the mountains and the sea. Its location in the valley and easy access to abundant natural resources probably had a great deal to do with the site’s extraordinary longevity. In the tenth excavation season at the site, the team excavated in four areas, exposing prehistoric remains from the Neolithic, Chalcolithic and the Early and Middle Bronze Ages, as well as the remains of a 19th century house. In Area V an impressive upstanding structure was uncovered in contexts dating to the Aceramic Neolithic period (c. 6000 BC), representing a very rare find of a built structure from this period. The feature is still enigmatic because of the keyhole exposure, but it appears to be a circular stone structure topped with plaster, resembling circular platforms from Kritou Marottou-Ais Yiorkis, although it could also be a wall of a small building similar to those found at Khirokitia. Above this circular structure were Late (Ceramic) Neolithic deposits that continued in use for several phases. This appears to be an unbroken sequence from the Aceramic into the Ceramic Neolithic period, potentially shedding light on a poorly understood period of Cypriot prehistory. 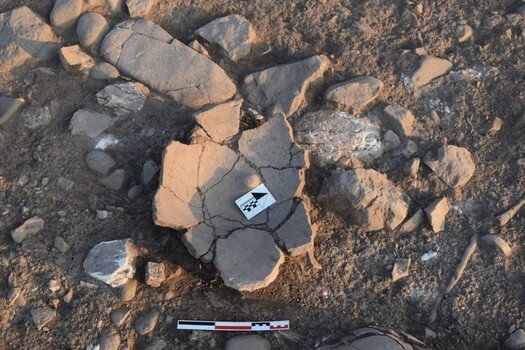 In Area IV evidence for Early Bronze Age (c. 2000 BC) occupation was located in an extension of a previously excavated roundhouse where excavations revealed a large open bowl with an unusual knobbed interior base sitting directly on the floor. The bowl had been placed into a special setting surrounded by stones within the larger arc of the roundhouse, indicating a place of special significance. The size of the bowl also suggests something other than everyday eating and could indicate feasting activities. This building’s use would have been contemporary with the construction of the famous ‘Vounous Bowl’ with its complex depiction of a building model and humans and animals within it. In the Bronze Age rectilinear architecture was common, but the fact that this building from Prasteio and the ‘Vounous Bowl’ are both curvilinear and feature areas of special communal significance provide tantalizing clues as to the nature of each. The settlement, its architecture and probably lifestyle in general, was significantly reconfigured in the Middle Cypriot period (c.1900 BC). This reconfiguration is accompanied by a massive series of terraces seen in several areas of the site, a new style of rectilinear architecture and new elements of material culture. These changes represent a new trajectory for the village which moved toward growing social stratification and architectural sophistication, culminating eventually in the abandonment of the site towards the end of the period. The final prehistoric activities on the site were investigated in Area XI where the remains are extremely well preserved, in some cases more than 2m in height. This is probably due to the deliberate infilling of the internal spaces during the terracing event. The interior spaces in the well-preserved rooms were excavated this season and on the first terrace a plaster floor with an animal (bull) protome figurine resting on the surface was found. This gives further evidence for the types of activities that took place in this space and for the type of society in the Middle Cypriot period at the site. Because this site is reported to have been the hideout of the infamous Hassanpoulia gang from the 19th century, the team felt it was important to recover any information that might assist understand the more recent periods of occupation on the site too. A previously identified standing building that was believed to be a 19th or 20th century AD farmhouse was investigated this season and materials were recovered that will help to shed light on the British Colonial period at the site and its unique place in the folk history of the island.